Step 1 Prepare the peppers: Cut off the tops of the bell peppers and set the tops aside. Remove the ribs and seeds from inside the peppers. Turn over on a wire rack to drain while preparing the filling. Step 2 Prepare the filling: In a large saucepan, add the quinoa to 2 cups water. Bring the mixture to a boil over high heat. Reduce the heat to a gentle simmer, cover and cook until the liquid is absorbed, the quinoa is translucent and the germ has spiraled out, 10 to 15 minutes. (Alternatively, follow the cooking instructions on the package.) Remove from heat and set aside, covered, until just barely warm. Fluff with a fork. In Recipes-list.com we have selected the most viewed recipes from category - Healthy eating Main courses Sides Vegetarian . Enjoy the best recipes specially selected for you! 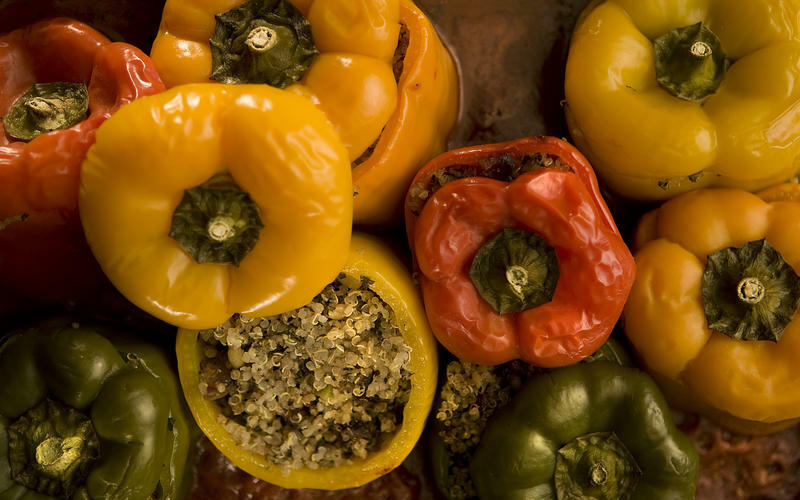 Quinoa-stuffed bell peppers is the right choice that will satisfy all your claims.